Will the 80s ever go out of fashion? For the last few years it’s been the go-to era for musical inspiration, on everything from the Drive soundtrack to mainstream synth pop. With Juveniles, the 80s are less inspirational and more an integral part of their sound – as with other similar French electro acts like Daft Punk or Justice. In fact, the duo’s debut album is something of a collage of 80s styles – from new wave to new romantics. There’s hints of Depeche Mode, Duran Duran and New Order in the instrumentation; Frankie Goes To Hollywood and The Human League in the synth lines (All I Ever Wanted Was Your Love and Through The Night especially); and a vocal reminiscent of Morrissey. There are plenty of contemporary comparisons as well, with Juveniles being easily filed next to the likes of Hot Chip, Yeasayer, Gypsy & The Cat, Metronomy and The Black Kids, with a touch of Two Door Cinema Club too. Yet, whilst the influences might be especially obvious, what the band might lack in originality they more than make up for in polished production, catchy but downbeat melodies, and an overarching sense of effortless cool – they are French after all. 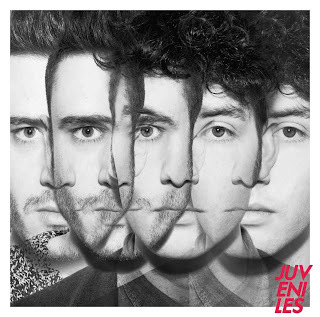 ‘Juveniles’ is mostly an upbeat, indie dance album, youthful positivity brimming from the buoyantly shuffling Strangers with its widescreen chorus, the funk disco of Fantasy, and the fizzing pop of Void (In & Out Of The), with ecstatic guitar solos throughout. That said, much of the album is heavy with nostalgia: the squelching bass of We Are Young, the moody beach-pop of Summer Nights, the wistful Washed Away, and the woozy Elisa. This is far from simply a nostalgia-trip though. Juveniles have crafted an electrifying debut that’s as futuristic as it is retro, proving they’re no mere 80s novelty act. Listen: Juveniles is available now.